ART YOUTH SOCIETY, or sometimes better known as AYS is a creative collective. By integrating different art forms, styles and cultural influences, we wish to give birth to new forms of expression and celebrate our generation’s unique heritage. We support people and ideas we believe in. To highlight the launch, Art Youth Society’s founder Ays Yuva has created a handmade fine jewelry line, inspired by street savy women about town; creative, diverse, good-humored and whip-smart. An effortless way to combine the best of modern and classic, urban and uptown, the Ays Yuva by Art Youth Society jewellery line debuted in December 2012 with the message of love at its core. The idea of Art Youth Society was born in 2010 when Ays Yuva created her first rings. The brand is inspired by fashion capitols New York, Paris and Istanbul, and fuelled by her passion for jewellery and fine craftsmanship; love and friendship always being present at the core of her designs. In 2012, Khaled Sufi joined Art Youth Society. Together they focused on the launch and brand development aspects of the AYS brand on a global scale. The brand quickly gained the attention of trendsetters and celebrities in the fashion and entertainment worlds attracted by the uniqueness of the brand. The combination of their cultures, influenced by a multitude of symbols throughout their lives, defines the unique styles of the AYS jewelry collection. Encouraged by the success of their rings and earrings, AYS has now expanded their jewellery line in various directions to include bracelets, pendants and necklaces. Designs for different projects have also been in the works, and production will start soon. The exquisite jewelry is designed and made in Istanbul. With more than 90 styles of heart, diamond and other geometrical, hand-shaped and polished jewelry, the AYS collection is always on trend. Each solid gold piece matches a certain personality, style or mood. AYS is wearable modern art teeming with symbolism, representing love, faith and hope, and encompasses the modern and classic, the urban and uptown. 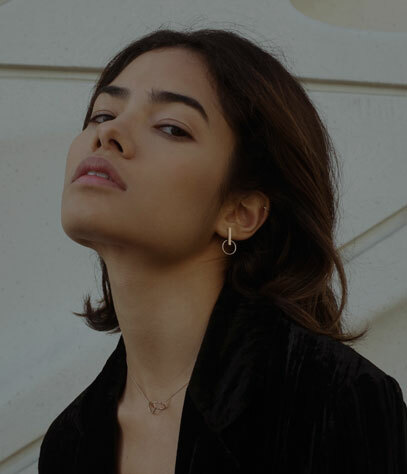 AYS‘ intriguing jewelry pieces are created around specific themes and encompass powerful symbols such as the Heart, the Hand of Fatima, as well as the Evil Eye, with the multicultural core of their brand and the Religion of Love always expressed in their creations.